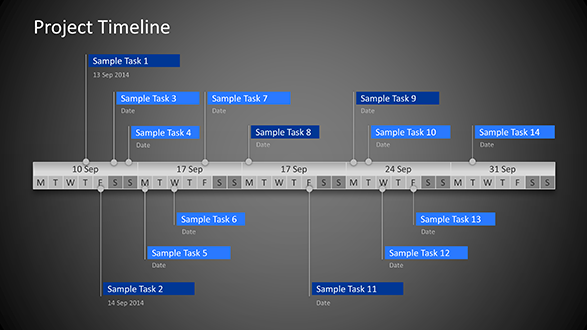 Timelines are a popular design tool in PowerPoint. But many associate it with a thin line with monotonous lined data. Our motto is: boring was yesterday. 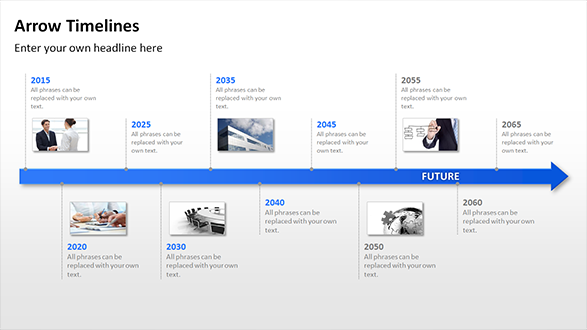 We have developed PowerPoint timelines that certainly add more pep to your presentation, and show the versatile applications of timelines. Many companies that have been successful for several generations build their career on numerous milestones. PowerPoint Timelines are the optimal choice to highlight these individual dates within the company’s history. Same for the future: you already know where you want to be in 10 or 15 years? Display your plans easily on an arrow with year dates. The more important events your company can register, the more necessary it will be to display many different points on a timeline without making the slide look too cluttered. We have developed specific timelines especially for such cases that mediate amounts of data compact and attractive. You can present your personal job history on the career ladder usinga timeline. If you apply via online application, you could use a small PowerPoint presentation saved as PDF. For example, present your resume with the main stages on a timeline and score points with an extraordinary stylistic application. In project management concepts are often planned to be implemented within a half year. On a time axis, you can vividly illustrate each of the objectives and steps of the project and implementation in PowerPoint. Goals of marketing, sales and management can be displayed at a glance and be planned better with the help of a time axis. Also the preparation for the next trade show could succeeds so much easier. Everything flows, because time never stands still, everything is always in motion and therefore in development. Timeline follow this principle. Let them be directed to the right, as we consider the sequence from left to right as positive and associate it with prosperity as well as progress. The arrow is the most expressive symbol that you can use for a timeline. It clearly defines purpose and reflects dynamics. You want more visual effects for your presentation? Add an atmospheric photo to the timeline. Pictures of mountains or a street symbolize progress and development. They are especially suitable for underlining your timeline data.